Macross Frontier. Do You Remember? Macross Frontier ended its run last week. I really enjoyed the anime. It has the winning formula of mecha action, romance, humour and of course great music. As we bid farewell to a great series and look forward to its theatrical release, let us sit back, grab some nyan nyan and recap the story from the beginning. Episode 1: Meet Ranka, your average 16 years old with a big dream. Ranka inspires to be a singer like her idol Sheryl Nome. 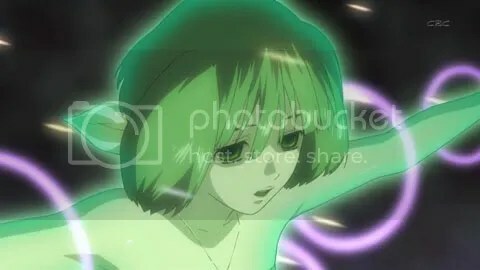 But deep down Ranka harbours a troubled past which even she doesn’t know of yet. 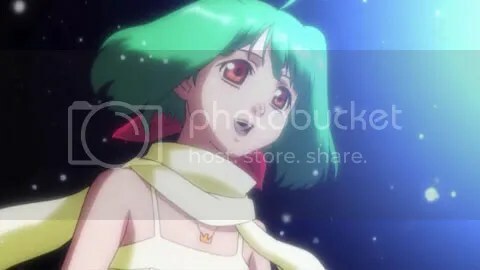 Episode 2: Ranka is at Sheryl’s concert when an alien creature known as Vajra began attacking the city. Ranka is caught in the crossfire but is rescued by Alto. An encounter of fate in which their destinies will interweave in near future. Episode 3: Ranka met Sheryl and Alto by chance one night when another Vajra attack occurred. 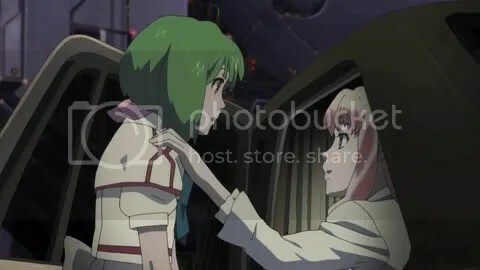 After the assault, Sheryl encouraged Ranka to follow her dreams as opportunities are always right in front of her. 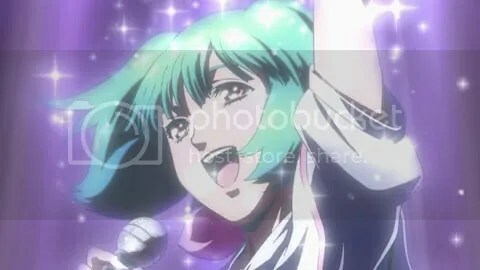 Episode 4: Ranka takes her first steps to achieving her dream and take part in the Miss Macross Beauty Pageant. Ranka did a modern take on Watashi no Kare wa Pilot but sadly didn’t win. 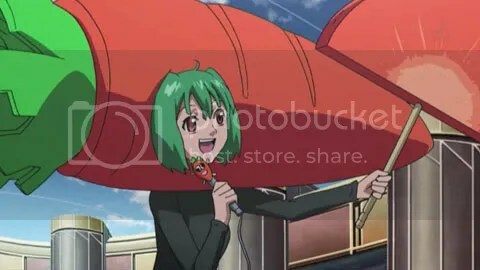 Episode 5: Ranka overcomes her fear and sings in public. It attracted a large crowd. 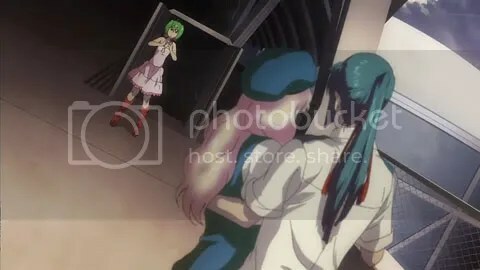 Ranka is shocked when she witness Sheryl kissing Alto at the mall. 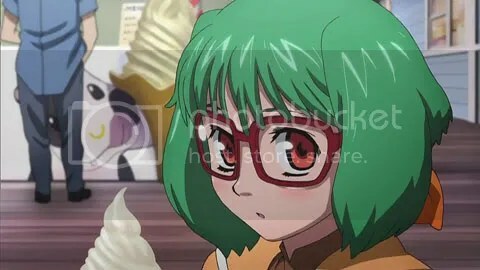 Episode 6: Ranka is approached by an agent who wants to sign her after hearing her sing at the mall. 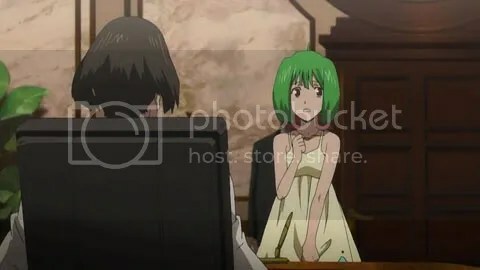 Ranka is sad when Alto lied to her that he was alone at the mall when in actual fact he was with Sheryl. 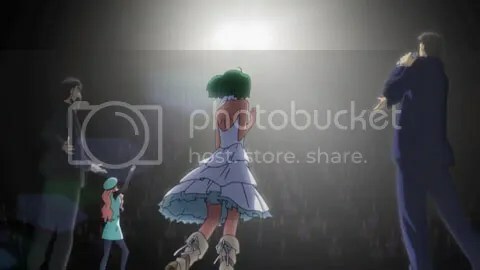 Episode 7: Ranka attends Sheryl’s farewell concert and encouraged Sheryl to carry on with her last song. At the same time, a huge battle unfolds at Sheryl’s home, The Macross Galaxy. Episode 8: Ranka gets her first job promoting carrots but the response was lukewarm. Ranka is granted a chance to appear on TV for the first time but is saddened to hear the show is cancelled last minute due to a Sheryl TV special. The animation this episode was very horrible. Episode 9: Ranka promoting her first single “Neko Nikki”. Episode 10: Ranka lands a role in a movie which was a hit with the audiences during the gala premiere. Episode 11: Due to the success of the movie, Ranka’s fame soars dramatically. Alto’s birthday is approaching and Ranka plans to give him a surprise. But Ranka is disappointed when Alto fails to turn up. She later found out that Alto is accompanying Sheryl for her concert at a planet where a battalion of Zentradi soldiers are stationed. Ranka adopts a small mysterious furry creature and name it Ai-kun. Episode 12: Sheryl got ill and is unable to stage the concert. The Zentradi fraction is angered and a fire fight broke out. Ranka arrives in the nick of time and calms the Zentradi soldiers with her new song. Yakh Deculture! 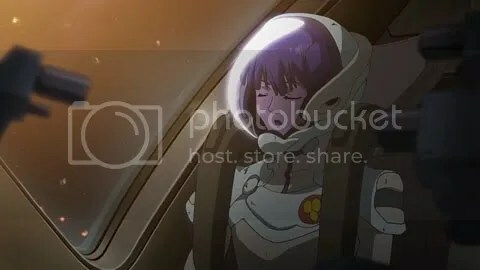 Episode 13: As Alto is flying Ranka back home, a strange disturbance cause the Valkyrie’s engines to fail and both of them clash landed in a jungle. Ranka is then abducted by the Vajras. Episode 14: While inside the Vajra’s nest, Ranka sees a vision of her mother. She is subsequently rescued by Brera Sterne, a person whom Ranka met from recent encounters. 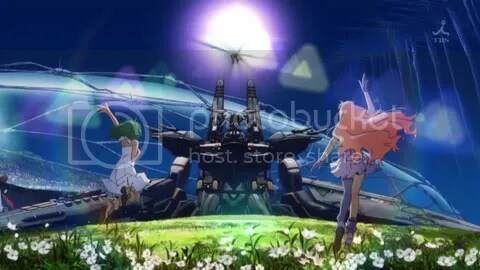 Episode 15: Ranka is told by the military that they want to use her song against the Vajra. 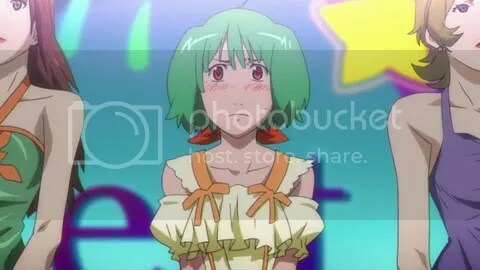 Ranka wonders why the person in front of her has such a weird looking hairstyle. Episode 16: Ranka’s song is used as an experiment in an encounter with the Vajras. It works. 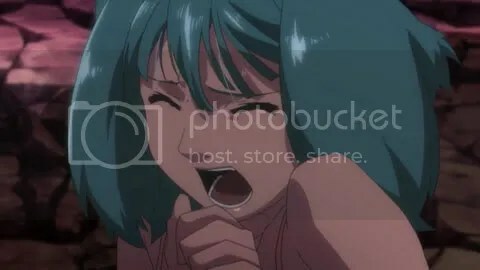 Ranka’s singing cause the Vajras to lose their bearing. Episode 17: Ranka stages her first live solo concert. 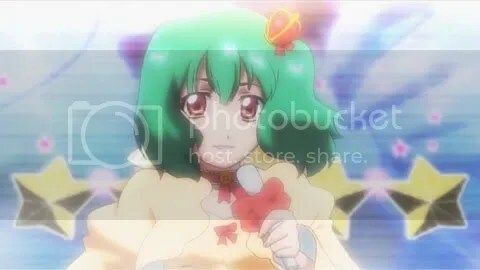 Episode 18: Ranka volunteers to sing when the Vajras attack again. Ranka’s song turned the tide of battle and a successful long-distance fold jump is initiated. 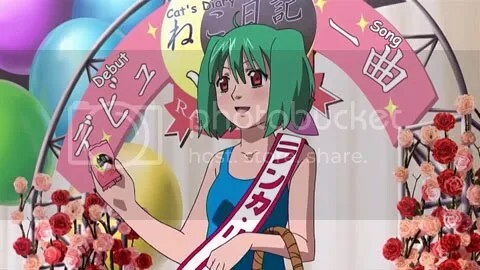 Episode 19: A parade is held to celebrate Ranka’s achievement in repelling the Vajras with her song. 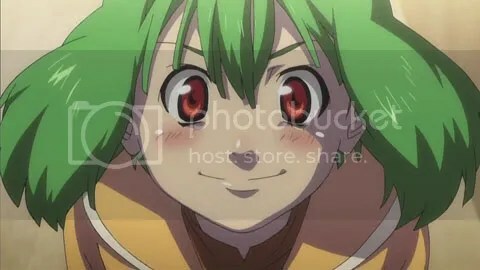 But Ranka didn’t participate in the parade as she is out with Brera looking for her missing pet Ai-kun. Ranka pull a Clark Kent disguise with a pair of megane and manages to fool everyone on the streets. Clever girl. 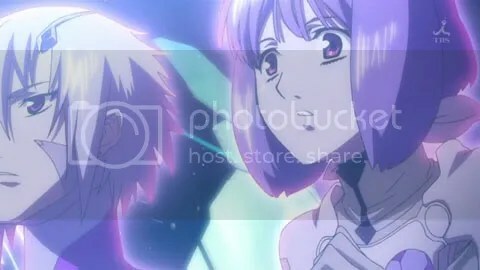 Episode 21: In the aftermath of the Vajras’ attack in which all of the alien creatures are annihilated with a fold bomb, Ranka asks Alto out late that night and tells him that she love him. 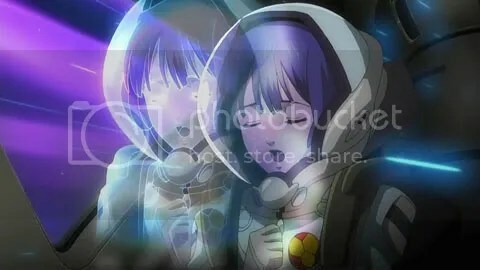 Ranka then bid him goodbye as she, a grown up Ai-kun who turns out to be a Vajra and Brera flew off into space to return Ai-kun to its own kind and also to find out more of her past. 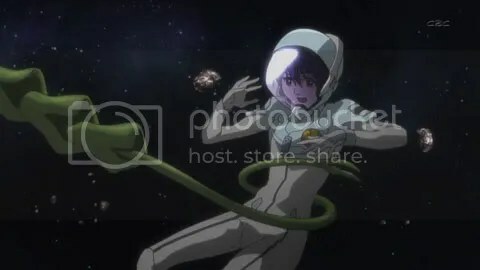 Episode 22: Ranka and Brera reaches Ai-kun’s home world, a beautiful planet that resembles Earth. Episode 23: Ranka is taken away by Ai-kun and the Vajra swarm. 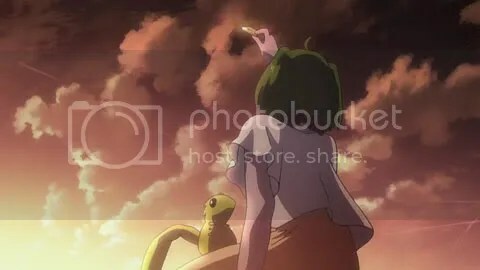 Ranka finally recollects her past. Both she and Brera realise they are actually siblings as well. Episode 24: Ranka is being held captive and brainwashed into singing to rally the Vajras to fight against the Macross fleet. Episode 25: All’s well that ends well. 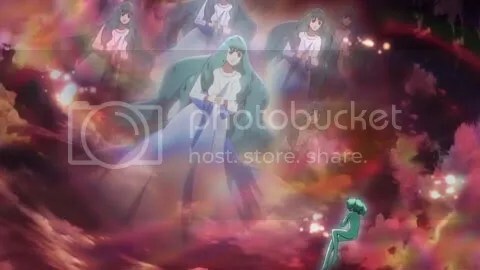 Ranka awakes from her manipulated state and together with Sheryl duets in multiple songs uniting the Vajra to fight against their real enemy. Upon landing on the Vajra’s Home world after the battle, Ranka declares to Sheryl that she won’t lose in terms of songs and love. Sheryl greatly accepts her challenge as both of then runs towards Alto as he descends from the sky. And there you have it, a brief summary of Macross Frontier. I dare say this is the best anime I have seen so far this year. Well unless Gundam 00 Season 2 can prove me wrong. Oh one last pic of our beloved ladies man before we go. In remembrance of those who fell in battle. 23 Responses to Macross Frontier. Do You Remember? i thinks this macross is just a cheap shot way of promoting singers. Regrettably, I never got into watching this. Been watching Lelouch geassing people instead. wow.. nice effort of summarizing each episode! Because it was free, I couldn’t exactly say, ‘oh that aint good enough, fetch me a widescreen! !’ lol. I’m against widescreen anyways… Gimme a bit chunky 4:3 ratio tv any day!! Most of the flatscreen tv’s I’ve seen arn’t even as good a quality picture as the good old chunky ones!! which is not a bad thing at all if the singers have quality. i on the other hand is the opposite. didn’t catch code geass at all. an hour last episode will be great don’t u think? no forgetting the naked scenes as well. if free? ok then no complains there. damn, avatars are not showing up. Unfortunately, Ranka was also the least interesting part of Frontier. I think this anime wasnot having a good ending.. as other said, too easy to end this anime. Meanwhile, i enjoyed to watch this anime, but in the no. 2 after Code Geass of course. Code Geass Rock! cool recap…i almost forgotten some of them. ^_^ i mean, that’s how I felt throughout the entire season. started off well, but somehow flustered in the middle and got itself right at the end with a good ending to satisfy everyone! 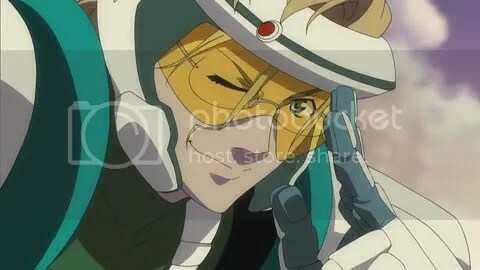 aih, judging from Gundam 00 S2 EP1, things are looking bright. Especially that S1 was a great season overall (not that I’m a Gundam fanboy or anything, I meh’ed at Gundam SEED and Destiny XP)! Could you believe I havent seen this show yet?? Yes, I do remember love. great series indeed. 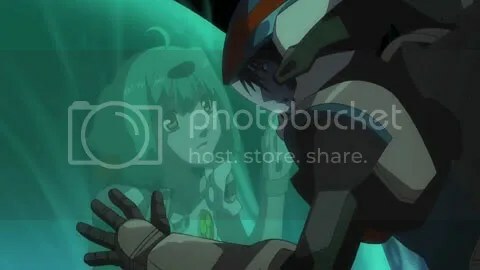 nice recap as well, we will certainly remember the love that macross frontier had gave all of us. cant wait for nyan tora the soundtrack! 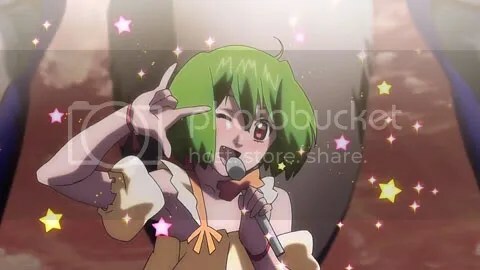 oh i absolutely love the episode where ranka sang seikan hikou. she was just too cute! me too. but not much details are known. like story, release date etc. ah yes. the animation quality can be quite bad if the previous episode involve a major battle. i enjoyed all the episodes. maybe except episode 8.
then i shall lock u up and get u to marathon watch it. never thought one could summarize the series in one post, but you did. lol. ^^ thanks for posting this. haha found it. thanks for the heads up!